Salad Servers (spoon length 30cm, fork length 27.5cm). Lovely non-matching but complementary set; consisting of a horn spoon with bone handle and striped inlays and fork made entirely from horn (natural colour variation may occur). 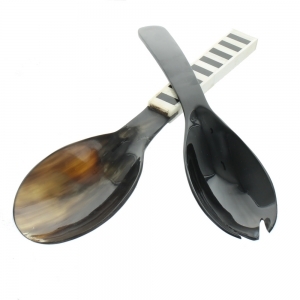 These salad servers are beautiful as well as practical and would make a fantastic gift.